Oil drilling in Ecuador has contaminated hundreds of square miles of Amazon rain forest. ELAW partner Pablo Fajardo is working to hold oil companies accountable for decades of polluting activities. ELAW helped Pablo document the compensation Chevron has paid to communities impacted by far less egregious contamination by Chevron in the U.S. In 2007, Pablo was named a CNN Hero. This award was given to "ordinary people who have accomplished extraordinary deeds around the world." Pablo grew up in poverty and worked for many years as a laborer in forests and oil fields. He completed his secondary education in night school and earned his law degree via a correspondence course. His first case is the massive suit against Chevron. Pablo embodies the spirit of hundreds of ELAW partners around the world. We are inspired by Pablo's commitment to justice for disadvantaged communities in Ecuador. 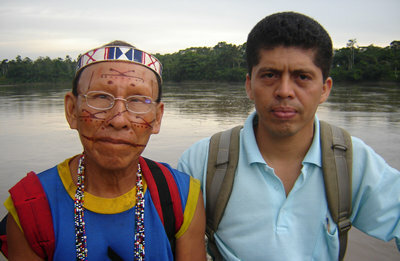 Pablo Fajardo (right) with a villager from Secoya. "Our work in Ecuador is an example of the good things that can happen when thousands of people, most without money or power, can come together in a common effort to better themselves and the planet"
ELAW congratulates Pablo Fajardo who won a 2008 Goldman Environmental Prize for his work with Luis Yanza to hold oil companies accountable for decades of polluting activities in the Ecuadorean Amazon. Please visit www.elaw.org/give to make a secure, online donation. ELAW partner Pablo Fajardo is working to hold oil companies accountable for decades of polluting hundreds of square miles of Amazon rain forest. ELAW helped Pablo document the compensation Chevron has paid to communities impacted by far less egregious contamination by Chevron in the U.S.